Offering you a complete choice of products which include seed spices processing machinery. Our company is a leading manufacturer and trader of high quality Seed Spices Processing Machinery our customers. These are made available to the clients as per the set industry norms and guidelines. Spices like black pepper, cardamom, coriander, cumin, fennel etc. are continuously being processed in our machinery. We have developed specific mechanized processes for the processing of whole chilli, turmeric, garlic and black pepper. We always ensure the on-time delivery of all of our products. We are offering a wide range of spices processing machinery and equipment specially adapted to the needs and requirements of the Indian processing industry. Several spices processing plants have also been supplied overseas. Spices like black pepper, cardamom, coriander, cumin, fennel etc. are continuously being processed in our machinery. We have developed specific mechanized processes for the processing of whole chilli, turmeric, garlic and black pepper. Unique and product specific processes for the cleaning, classification, de-awning of seed spices like black pepper, coriander, cumin, fennel, fenugreek etc. Special features include complete automation, dust and pollution free operations and product classification to meet whole seeds requirement, and spice powders. Photograph shows storage silos of black pepper processing plant set up in Kerala, India. 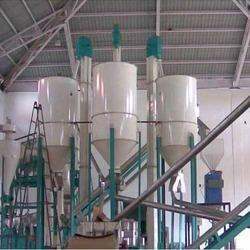 Looking for Seed Spices Processing Machinery ?